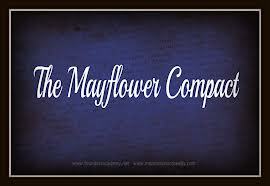 LESSONS FROM THE MAYFLOWER COMPACT…. History is valuable if we learn from it. It is a curse if we ignore the lessons it affords. In the early years of this land and prior to our becoming a nation the foundation was laid for what kind of people we would become. I want to share some quotes and some thoughts here. The Plymouth plantation had at its heart to honor God and believed that what they were doing glorified the Lord and would advance the Christian faith. They perceived no eventual rebellion against England or the king’s authority, and declared that their foundation and loyalty was to God above all else and that very thing would help lead to the eventual Revolutionary War. Fisher Ames the author of the 1st Amendment wrote an article called “School books” in the Pladium magazine in January 1801, “We have trouble in the classrooms we are putting in new text books. Nothing wrong with new books but we are spending more time on them than the Bible; it is drifting to the back of the classroom. We cannot tolerate this in American education. The Bible’s pure morals, its examples are captivating and noble.” My how far we have drifted from that today! Today the Bible is banned completely from the classrooms in our public schools, something the founders would have never believed possible. Moving forward we find Calvin Coolidge saying, “The fundamental basis of this nation’s law was given to Moses on the Mount. The fundamental basis of our Bill of Rights comes from the teachings we get from Exodus and St. Matthew, from Isaiah and St. Paul. I don’t think we emphasize that enough these days. If we don’t have the proper fundamental moral background, we will finally wind up with a totalitarian government which does not believe in rights for anybody but the state.” Wow, even closer to us than Washington and Presidents still believed that the Bible and God were important in our lives and in government. Okay my rant is this, we sat like the proverbial frog in the pan and allowed the slow heating of the water to the point of boiling and now we are dying and losing our nation while we have not done enough to prevent it. It is time that we STAND UP and STEP UP to the task of reclaiming America. Agree or disagree with me that is your right, but if you love America as a Free Nation then you should want the Constitution honored. Demand our Freedoms be preserved and help us boot out all in elected offices that are not willing to defend and protect that. May God bless and protect you and may God preserve and protect America! WHERE HAS THE AMERICAN DREAM GONE? I do not ask that question believing that it no longer exists but rather I question the pathway it has taken and what the end result of that path will be. I believe that the vision, spirit, and dream of the Founding Fathers exists in the hearts of many Americans today, sadly too many have grown silent and become somewhat isolationist attempting self-preservation at the expense of the nation. Under George W. Bush, who made many mistakes and misguided decisions in governing, there was a successful painting of him and all conservatives as uncaring, unfeeling, money hungry, corporate stooges trampling on the dreams of the middle and lower classes. Obviously, not all Republicans, Libertarians, Independents, and those of a conservative mindset are a part of the so-called 1% and rich. The left-wing radicals painted us with a broad brush and they labeled the Tea Party as the most hate-filled organization of citizens since the Klu Klux Klan. They used class warfare, played the race card, and played on the fear and emotions of the masses to elect a Congress controlled by the Democrats during the mid-term election of Bush’s last four years. Then in 2008 that same paranoia and smear campaign produced Barack Obama as the President of the United States of America and at that point for two full years he and the Democrats controlled everything in two branches of the federal government. They had the Whitehouse and the Congress and had such a majority in Congress that they ignored the opposing voices and as Barack Obama told the leaders of the Republican Party – “Elections have consequences, you lost deal with it.” At that point we were force-fed numerous diabolical and destructive pieces of legislation including the “Affordable Health Care Bill” known as ObamaCare. At the time of voting on it in the House of Representatives speaker Nancy Pelosi said, “We have to pass the bill to find out what is in it.” How in the name of rational thinking could anyone accept that and the lame excuses from members of Congress that it was so large that they could not possible read it or even understand it, but they PASSED IT! In a family, classroom, or business that would have resulted in immediate repercussions including punishment, failure, and loss of one’s job or business but not in our government. We allowed our elected officials to get away with that and although we complained and the vast majority of Americans expressed they didn’t want it, WE GOT IT! In the time of our fledgling nation a French political thinker and historian named Alexis Charles Henri Clerel de Tocqueville wrote his now infamous book “Democracy in America,” in which he saw the dangers that our Founders had so adamantly warned us of and correctly identified the means whereby America could and would eventually fall. Although we have not yet fallen we are rapidly descending the ladder of destruction that de Tocqueville warned of as did many of our founders. His famous quote is glaringly accurate as we look at the world and this nation with regard to the peril that we are facing. He said: “The American Republic will endure until the day Congress discovers that it can bribe the public with the public’s money.” ― Alexis de Tocqueville If that is not where we are today I guess I’m completely out of touch with reality. We have seen this building for decades and it has reached the point where almost if not one-half of our nation receives all or most of its livelihood from the Federal Government. People vote according to how they are personally impacted it seems rather than based on principle or for what is in the best interest of this Free Nation. He also said: “Americans are so enamored of equality; they would rather be equal in slavery than unequal in freedom.” ― Alexis de Tocqueville What insight, as we look back with hindsight. What is one of the major themes of Obama’s message? FAIRNESS and EQUALITY. Yet in seeking what he calls a level playing field he and the powers that be are robbing us of our individual liberties and freedoms and it seems that people are content to live equal in slavery rather than unequal in freedom. Life is not now nor has it ever been FAIR. God did not promise that life would be fair; He promised that He would be just. He further warned, “Democracy extends the sphere of individual freedom, socialism restricts it. Democracy attaches all possible value to each man; socialism makes each man a mere agent, a mere number. Democracy and socialism have nothing in common but one word: equality. But notice the difference: while democracy seeks equality in liberty, socialism seeks equality in restraint and servitude.” ― Alexis de Tocqueville I know that for me to address the policies and politics of Barack Obama as Socialist or worse is to open me up to the charge of racism. If that is the basis of being a racist, to disagree with a sitting president then I’m guilty as charged. However, I disagreed with many things that Bush did so was I a racist then? No! The left would applaud that criticism but not of Barack Obama he is immune from criticism or so the left and media would have us believe and agree to. Sorry, but my patriotism will not allow me to passively accept whatever Big Brother wants to send my way! I believe in the Declaration of Independence and the Constitution and above all the Bible and each of those propels me to a different line of thinking than that of the left. I want to give you four more quotes by Alexis de Tocqueville and then give you my final thoughts and you decide for yourself where the American Dream Has Gone. Political parties were an anathema to many of our Founding Fathers because they saw how they could evolve into machines that would be controlled by the corrupt and cost the individual his/her liberty and freedom. Are we not there? Many of our Founding Fathers agreed 100% with de Tocqueville that Liberty required morality and morality faith and could not be legislated. His grave warning concerning the greatness of America and when America would cease greatness is most sobering. As a nation and people we are demonstrating our propensity to depravity on a major scale and what will the end result of that be? The final quote that I gave you is so powerful it should touch our hearts and move us to a place of prayer in repentance before God, but so many believe that God is rightfully banned from all things political. Yet, the truth is, God’s involvement and investment in every dimension of human life is undeniable. In my view, without Him we will succumb to tyranny and be victimized on a scale that only the Book of Revelation can envision. Our government is running amok today and unless we somehow find a way to bring it in check we will have seen the Great America that we were given by those patriots who so valiantly fought and died, and those who in generations past have defended the right of freedom, liberty, and a Constitutional Republic will be forever lost. I sit in tears as I write today and pray to Almighty God for mercy and forgiveness. I too have been slack in times past and did not fully grasp the grave danger we were in and hope that it is not too late to stem the tide of this path to destruction that we are on. May God bless and protect you and may God deliver America! DAY TWO AFTER THE DISASTER….. I am not coming here today to tell you that I have the answers to what happened or the clear direction of where we should go or what we should do. I am coming to say a couple of things in hope that it will help all of us move toward the next step. WE CAN EITHER CAVE IN OR RESIST. What do I mean? We can either fold up our tents and crawl into our own little worlds trying to protect what little we have left and watch the rest of the world go to “you know where” or we can resist and refuse life as rugs walked on. One way, and the most important way, is to make “intercessory prayer” a part of our lives in a significant manner. A.	Pray for the “leaders” even the ones we don’t believe are legitimate leaders, that God will move on them, expose them, or do whatever is necessary to bring them into the light. B.	Pray for our “fellow believers” that God will protect and provide for them in this time of crisis. C.	Pray for “lost souls” that God will somehow engineer their situations so that they will become receptive to the message of the Gospel. Another way is to selectively choose issues that are critical to us and go on a “letter writing campaign” to our elected officials. B. Make a list of issues and on a rotating basis – “weekly, bi-monthly, or monthly” contact your elected officials on these issues and not only request follow-up but follow-up yourself so that they will know that you are serious. A third way is to “become involved” in organizations such as a local Tea Party or start one and begin planning now for the next election cycle with potential candidates, campaign strategies, and efforts to raise funds. A final way is to “prepare” yourself spiritually, emotionally, financially, and physically to protect and defend that which is rightfully yours and your family. I won’t go into detail as to what that might include or involve I will leave that up to you. My family has been and will continue to seek to hedge against the dollar’s devaluation with things that will retain value and items with which we can barter. We also are securing generators that can operate should the power go out to give us some stability in our home. We are seeking to amass a supply of non-perishable food supplies and locate possible places we can turn to for the harvesting of game, fish, and producing vegetables should that type of crisis arise away from the city and in secluded areas. We are also prepared to defend our home and our persons against those who would come in and forcible take what does not belong to them. We cap that off with regular and consistent time of communion with the Lord, not making it last but making it the capstone of what we do. I cannot speak directly at this time to each of you as to what is right for you but we are working on possible contingency plans that address various scenarios and as the Lord nudges my heart I will share some of those. Until that time, I offer the aforementioned items as possibilities for you to consider any or all of them. America as we have known it faces doom without divine intervention from God and a unified, concerted effort by those of us who I would call “patriots.” We did not get out the vote in this election. There were millions that, for one reason or another, who opposed Barack Obama, chose not to go to the polls while his base and supporters did. That is a shame but a reality and we can’t change that now but we can work toward making sure it NEVER HAPPENS AGAIN! It is my genuine prayer that God bless and protect you and that God deliver America!